Chris O’Dell completed a sweep of the first three derbies held at Los Alamitos in 2019 after Rosenthal Ranch LLC’s Powerful Favorite racked up his major win of the meet after outdueling Dunn Ranch’s Apollitical Pence in the Grade III, $211,000 El Primero Del Año Derby on Sunday night. It was the second derby win of the year for Powerful Favorite following his daylight victory in the Grade 1 Los Alamitos Winter Derby on February 9. O’Dell also won the La Primera Del Año Derby on Saturday night after Parsons Family Limited Partnership’s Terrific First Down won the Grade III, La Primera Del Año Derby for fillies. She had previously run an impressive third to Powerful Favorite in the Winter Derby. Jockey Eduardo Nicasio also completed a derby sweep, as he’s piloted both Powerful Favorite and Terrific First Down. Powerful Favorite broke sharply from post number nine, but he trailed Apollitical Pence by neck. The two continued to battle with Powerful Favorite eventually moving past his rival while finishing in great fashion. The gelding by Favorite Cartel and out of the tremendous broodmare Remember Me Rose covered the distance in :19.733 while posting his seventh in 13 career starts. Also a winner of the Governor’s Cup Futurity last year, Powerful Favorite earned $88,620 for the win to take his career earnings to $496,835. Powerful Favorite had to catch Apollitical Pence in the trials to the El Primero on March 10. He stumbled out of the gate on that night, but was flying late to win with the fastest qualifying time. Bred by James Markum and Dr. Steve Burns, Powerful Favorite is now a perfect four-for-four this year. It’s also been a little over a year since the passing of Robert Rosenthal, the patriarch of the Rosenthal Ranch. The longtime owner got a chance to enjoy Powerful Favorite as a yearling and early in his 2-year-old campaign, but his memory continues to be ever present whenever the sorrel gelding steps into the winner’s circle after one of this races. Led by Connie Rosenthal, the Rosenthal family was well represented in the winner’s circle on El Primero night while enjoying another victory thanks to their big star. With Ayala aboard for trainer Monty Arrossa, Apollitical Pence earned $35,870 for his career best second place finish in a stakes race. The Apollitical Jess gelding finished third in the Golden State Million Futurity and Laico Breeders Stakes last year. He was also a part of the Ed Burke Million Futurity and Los Alamitos Two Million Futurity. 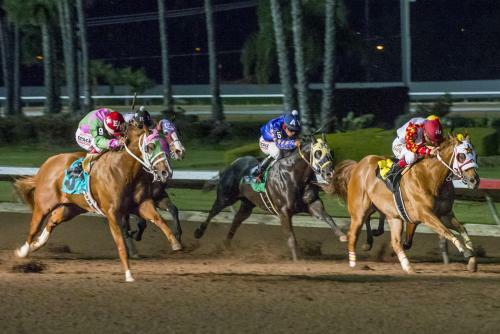 Bred by Dunn Ranch and Womack Cavender Farms, Apollitical Pence, who is out of the Tres Seis mare Send City, has now earned $308,214 in 11 career starts. Martha Wells’ homebred Red Hawk Cartel earned $25,320 for his third place finish in the El Primero. Ridden by Erasmo Gasca for trainer Matt Fales, Red Hawk Cartel was eight at the start before flying late to earn the show money. Dexxter, Ali Babe Foose, Bail Czech, KR Hi Five, Teller Hez Famous, Tac Me Up and Jess Curlin completed the field.